The Wizards have decided to part ways with longtime president of basketball operations Ernie Grunfeld, league sources tell Marc Stein of The New York Times (Twitter link). According to Stein (via Twitter), Grunfeld was informed of the decision today by team owner Ted Leonsis. The Wizards have confirmed the move in a press release, announcing that senior vice president of basketball operations Tommy Sheppard will assume interim GM duties. The club will launch its search for a permanent head of basketball operations at season’s end, and will consider Sheppard a candidate. 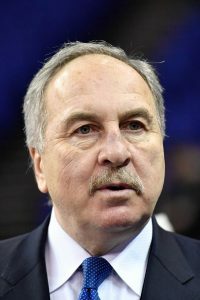 Grunfeld, who had been one of the NBA’s longest-tenured top executives, took over as the Wizards’ president of basketball operations back in the summer of 2003. Since then, the team has compiled a record of 568-724 (.440) and made the playoffs eight times. Washington has never advanced beyond the second round of the postseason during that 16-year stretch. In recent years, the Wizards failed to live up to lofty expectations with a roster that featured All-Star guards John Wall and Bradley Beal. The team finished eighth in the Eastern Conference a year ago and was bounced in the first round of the playoffs before missing the postseason entirely this spring. Grunfeld has also made some questionable salary-cap decisions in recent years, including long-term, big-money deals for Wall and Ian Mahinmi. Wall’s four-year super-max extension, worth a projected $170MM, will go into effect this summer, so the new head of basketball operations will have to work around that contract. It remains to be seen which direction the Wizards will go under new management, but with Wall expected to miss most or all of the 2019/20 season due to an Achilles tear, a retooling – or even a full-scale rebuild – appears likely. Beal will be a key player to watch going forward — Grunfeld and Leonsis had stated they were committed to keeping the star guard in D.C., but it’s possible a new general manager will view things differently. It also makes sense to keep an eye on head coach Scott Brooks, though as Jeff Zillgitt of USA Today notes (via Twitter), Brooks still has two years and $14MM left on his contract. He seems like a good bet to be back for 2019/20 at least. While no specific names have been cited yet as Grunfeld’s potential long-term replacement, ESPN’s Adrian Wojnarowski reports (via Twitter) that team ownership has been active in pursuing search films to help with the hiring process. Wojnarowski suggests that it should be an attractive job, given the geography and the resources available. The Pelicans, the Suns, and perhaps the Timberwolves will be among the other teams competing with the Wizards for general manager candidates this spring. Stein hears from league sources that Sheppard, Grunfeld’s interim replacement, will receive consideration from the Pelicans for their GM opening (Twitter link). New Orleans is also interviewing executives Larry Harris (Warriors), Trajan Langdon (Nets), and Gersson Rosas (Rockets), all of whom could be of interest to Washington. The Wizards fell just shy of the Celtics in their Eastern Conference Semifinal showdown and now must look at ways to improve if they hope to take the next step as a potential contender. One place they can start, point guard John Wall tells Chris Miller of CSN Mid-Atlantic, is with their bench. While Wall and shooting guard Bradley Beal led the Wizards with 27.2 and 24.8 respective points per game this postseason, mid-season trade acquisition Bojan Bogdanovic was their most potent reserve averaging a modest 8.8 points per game. Brandon Jennings, another mid-season Wizards target charged with the task of jump-starting the second unit, posted averages of just 2.8 points and 1.8 assists per game in the playoffs. The Hawks have interviewed Wizards VP of basketball operations, Tommy Sheppard and Warriors assistant general manager Travis Schlenk in their ongoing search for a new executive, Marc Stein of ESPN writes. A recent profile from the Sun Sentinel’s Ira Winderman features Heat assistant general manager Adam Simon‘s and his background scouting internationally. The Celtics may have offered a first-round pick to the Heat in exchange for Justise Winslow back on draft night in 2015 but it wasn’t the Nets pick, Ira Winderman of the Sun Sentinel clarifies. A column by George Diaz of the Orlando Sentinel draws comparisons between Lonzo Ball and Shaquille O’Neal, citing the overbearing presence of their respective father figures. The Magic have several options that could realistically be available to them at the No. 6 pick, including De’Aaron Fox and Malik Monk. Josh Robbins of the Orlando Sentinel breaks them down. The Nets have requested permission to interview Wizards senior VP of basketball operations Tommy Sheppard for their GM vacancy, a source said to Brian Lewis of the New York Post. He joins Bryan Colangelo, Arturas Karnisovas and Gersson Rosas as contenders for the position, Lewis notes, having reported earlier this week that Danny Ferry was no longer a viable candidate. John Calipari is a long shot candidate, but remains a possibility because of his strong support from CEO Brett Yormark, according to Lewis. Brooklyn already reportedly received permission to speak with Karnisovas and Rosas. Washington denied a June 2014 request from the Grizzlies to interview Sheppard, as Chris Vernon of 92.9 FM ESPN in Memphis reported at the time, so it’s no lock that the Nets will have the chance to pursue him. Sheppard has been with the Wizards for 12 years and assumed his current position under GM Ernie Grunfeld shortly before the 2013/14 season. The Nets reportedly want to hire a GM before the trade deadline, which is two weeks from today. Assistant GM Frank Zanin has been running the front office since the team removed Billy King from the GM job nearly a month ago. Wizards president Ernie Grunfeld remains in charge, but D.C.'s front office is getting a makeover, the team announced on its website. Tommy Sheppard gets a promotion and will presumably serve as Grunfeld's right-hand man. The Wizards have brought in other officials from the Raptors, Thunder and Hawks. Washington's offseason additions will allow the Wizards to play more small-ball this season, as J. Michael of CSNWashington.com examines. The opposite approach is taking place in Orlando, where No. 2 overall pick Victor Oladipo will play the point and Maurice Harkless will see some action at two guard, HoopsWorld's Alex Kennedy tweets. In today's mailbag, a reader asks Ira Winderman of the Sun Sentinel if Michael Beasley could eventually find his way into the Heat's starting lineup ahead of Udonis Haslem. Winderman doesn't see that as a likely outcome, as the starting five is already overloaded with scorers. Beyond that, Beasley has to prove himself as being worthy of a roster spot and worth an extra $2MM+ when factoring in his salary along with the luxury tax. Nuggets assistant GM Pete D'Alessandro and director of player personnel Mike Bratz are viable options, sources tell Ken Berger of CBSSports.com (Twitter link). Wojnarowski speculates that the Nuggets could promote D'Alessandro or go after Cavaliers assistant GM David Griffin. The Nuggets offered Griffin the job in 2010, but he turned them down, leading Denver to turn to Ujiri. Other executives who figure to be top candidates include Gersson Rosas of the Rockets, Bobby Marks of the Nets, Tim Connelly of the Pelicans, Wes Wilcox of the Hawks and Scott Perry of the Magic, according to Wojnarowski. The Nuggets could have some competition if they want to go with D'Alessandro, since Grizzlies GM Chris Wallace, the leading candidate to take the GM job in Sacramento, would like to hire him to work in the Kings front office, Amick reports (Twitter link). Warriors assistant GM Travis Schlenk interviewed well with the Kings, Amick tweets, arguing that Schlenk could be a fit in Denver if it doesn't work out for him in Sacramento. Assistant GMs Tommy Sheppard of the Wizards and Jeff Weltman of the Bucks have ties to the Nuggets and bear watching as the Nuggets' search takes place, tweets Marc J. Spears of Yahoo! Sports.